Many people still carry a torch for Guido Cantelli, the brilliant Italian conductor tragically lost in a plane crash in 1956. Cantelli was primed as Toscanini's successor, and would surely have gone on to great things, as a handful of surviving recordings suggests. "Most of all, we find this abatement of the tragic element in Tchaikovsky's mind in Cantelli's firm and far-seeing treatment of the motto theme, in its first presentation and especially in its returns on sides 5 and 7. The last movement he makes sound positively hopeful, encouraging rather than, as sometimes, merely making the best of things. All praise to the performance, then..."
For the moment, the symphony fills a useful gap in that this 1951 EMI recording does not seem to be otherwise available. But I’ve just seen EMI announce a Cantelli box in its “Icon” series, which will presumably include it, and will probably be available by the time you read this. On this evidence, the recording itself is close, opaque, compressed, and rather colorless, about which there’s probably not much to be done (Pristine’s transfer is in the expert hands of Mark Obert-Thorn). The performance is new to me, and I confess to finding it quite astounding—not a bar of routine in the entire work; the familiar Cantellian qualities of ferocious control, clarity, and articulacy, but on this occasion with no sacrifice of spontaneity or sense of a real performance on the wing (in contrast to his EMI “Pathétique” with the Philharmonia the following year, which has always struck me as a little studio-bound, over-controlled). The slow introduction is kept on a tight rein, following which the Allegro con anima is fast and precise (13:00) but with a surprising flexibility, for example, the bridge, Rehearsal C ff., slightly held back for even greater force and clarity; the result is an increase, not a decrease, in tension. The Molto piu tranquillo third theme (12 before Rehearsal H) is much faster (closer to the main tempo) than usual, purging the melody of sentimentality and lending it a rare gracefulness and coherence. In the recapitulation, Cantelli impresses by his penchant for fresh rethinking of the transposed return of material from the exposition—see the first of the two secondary themes (C♯-Minor, Rehearsal T + 8), projected with (relative to its first appearance) a noticeable increase in intensity, vehemence of attack, and rhetorical emphasis. The strings’ introduction to the Andante cantabile displays a curious (rather Mengelbergian!) didactic touch in the pointed break between bars 4 and 5, presumably to the end of clarifying the quadratic symmetry of phrase structure. In Cantelli’s hands, the movement has an atmosphere of hypnotic concentration, a darkly elevated, sacralistic quality. Wind solos are projected with great solidity and vocal eloquence. Fresh-minted observation of detail is everywhere in evidence, and nothing escapes Cantelli’s eagle eye—for a small example, see the extraordinarily vivid, precise realization of Tchaikovsky’s injunction Piu animato–ritenuto in the repeated violin figure two bars before the contrasting middle section (Rehearsal C + 7). The reprise’s gradual buildup to the movement’s climax attains an overwhelming intensity through Cantelli’s fanatical strictness of control. The Waltz is rigorous and articulate (see the 16th-note thread through the middle section—this is faster than it sounds!). The finale is taken at a surprisingly measured pace, with a quality of weighty compactness and a refusal to get over-excited. This pays dividends in the second theme (Rehearsal E ff. ), where Cantelli’s precision and grace (with a pointed slight over-dotting of the oboe motive, then passed to cellos and basses) contrasts with the usual slightly frantic feel here. 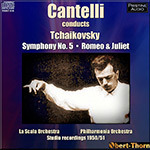 By comparison, Cantelli’s later live versions of the symphony (NBC, 1952, Music & Arts; Boston SO, 1953, Pristine) are a little slower, more malleable and less single-minded in the first movement, but consistently faster in the other three. “Single-minded” might be an even more apt descriptor for Cantelli’s dry-eyed Romeo, clocking in on the fast side at 18:27, though the timing is more the result of his complete lack of indulgence (though not of a subtle flexibility) in the lyrical music than of any unusual speediness in the main Allegro giusto. What sticks in the memory is that characteristically Cantellian combination of legato solidity and keen rhythmic edge, investing the whole thing with great power and sweep, delivered with high polish by the Philharmonia. Transfer-wise, the competition here is with Testament (as a filler to the aforementioned Philharmonia “Pathétique”); though Pristine’s sound is solid and well focused, I find Testament’s superior in impact and richness. In sum, Cantelli’s La Scala Fifth is a must-have. This will do very nicely, though I’ll be curious to hear how it compares with the EMI “Icon” release. This article originally appeared in Issue 35:5 (May/June 2012) of Fanfare Magazine.